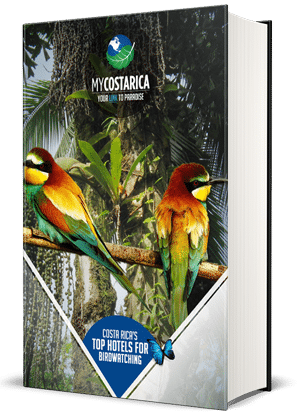 "See all the birds you find in the pictures with your free Costa Rica Birding Guide"
What’s in your Costa Rica Birding Guide? Visiting Costa Rica is all about Birding. There isn’t a region that doesn’t have great locations for spotting all the famous Central American birds. 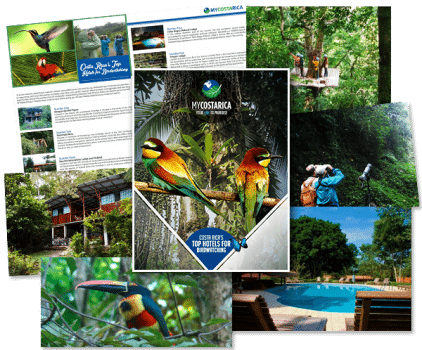 My Costa Rica travel agency can help you with both finding the best hotels and tours for Birding. We have all the insider information on how to travel in Costa Rica. Check out the Costa Rica Birding Guide. What type of birds will you find in Costa Rica? Costa Rica, in general, holds a huge variety of wildlife, birds alone have 918 different species with 200 being migratory. Some of the most popular species being Parrots, Toucans, Quezals, and Hummingbirds. Come and see how many you can spot. What are the popular spots? Some of the most popular birding spots include Tortuguero, Monteverde, Arenal, Osa Peninsula, Manuel Antonio, San Gerardo, and much more. The lodges in these areas are spectacular. They include all amenities to bring the best birding experience. Also on each tour, you can choose to go alone or take along a guide that will spot each and every bird to bring the best chances to see what you are looking for. Let us help plan your next birding adventure to Costa Rica.